Well, for over a month now I may as well consider myself Kevin Costner. I guess the parallels are not that dramatic. I'm not drifting around a post-apocalyptic land-free world... I'm just off Newfoundland and Labrador working on a seismic vessel. When you don't see land for a few weeks, though, you begin to wonder. I don't have any wild tales from the high seas. I literally mean high seas because we've had days where the waves have registered in at over 10 metres high. All in all, the whole process gets routine very quickly and you look forward to anything out of the ordinary. The usual suspects quickly establish themselves. 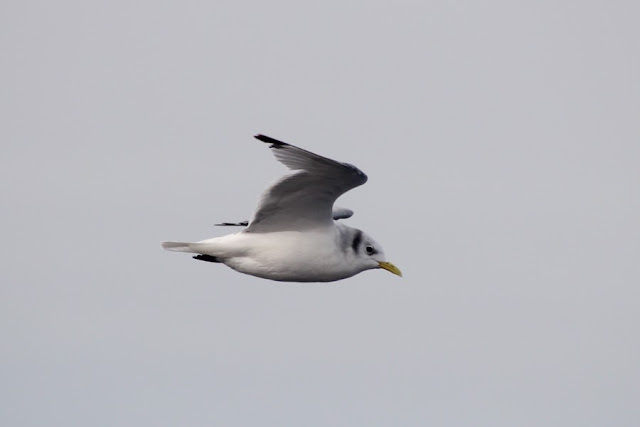 As soon as you get out of any bay or harbour, you will be followed by Northern Fulmars and Black-legged Kittiwakes. Those two are pretty much the poster birds for the North Atlantic. 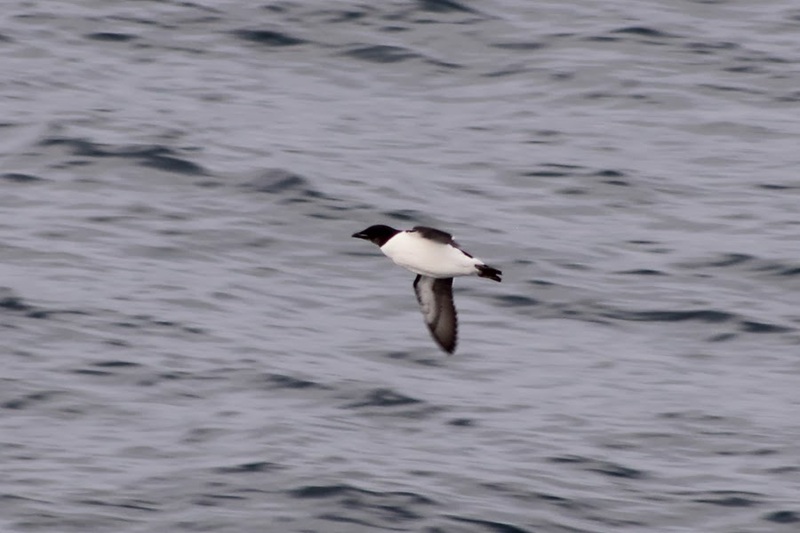 Other species that are regular include: Great Shearwater, Sooty Shearwater, Great Skua, Pomarine Jaeger, Glaucous Gull, Great Black-backed Gull, Thick-billed Murre, Dovekie, and Atlantic Puffin. In the waters off Newfoundland, as you get closer to shore, you are likely to see Northern Gannets, Common Murres, Red Phalaropes, and, if the waves are up a little, Leach's Storm-Petrels. With a suite of birds that are fairly novel to southern Vancouver Island birder, you'd think I would be out trying to get good photographs all the time. Well, that would be true if the birds were more cooperative and it wasn't so darn cold standing out on the decks. 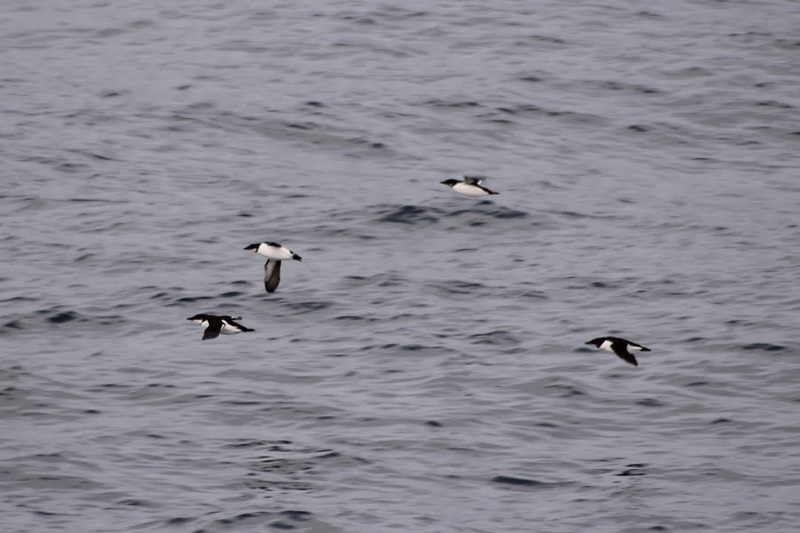 Additionally, the vessel is quite high up over the water which immediately puts most birds over 20 metres away. I have to hope that birds do close passes to the vessel and I have to have my camera ready and set properly according to the light conditions. 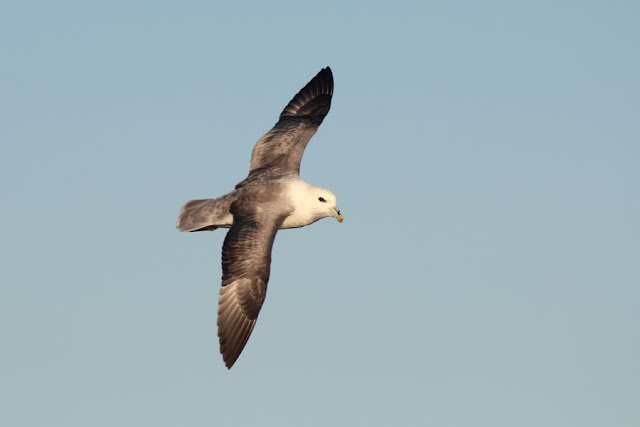 For most birds, I purely have record shots. I have not had a good photo opportunity for a good number of the species listed above. Some birds have been downright frustrating! Because Great Skua is a fairly sought after species from a North American birding standpoint, I have been trying to get a good photo of one right from the start. Five weeks later and I just have record shots to show for it. I am humbled by good seabird photos now! Now that I've made a bunch of excuses for my photography and lowered your expectations, let's get on with the show! Life on the ship would be one step closer towards dull if it wasn't for the element of the unexpected. 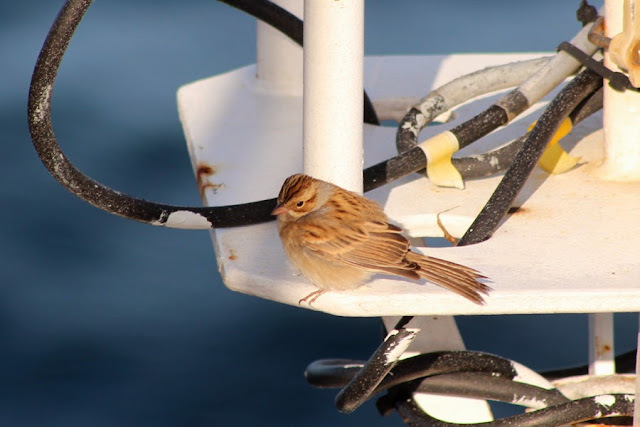 During my time at sea, having a passerine land on the boat is as exciting as Christmas. 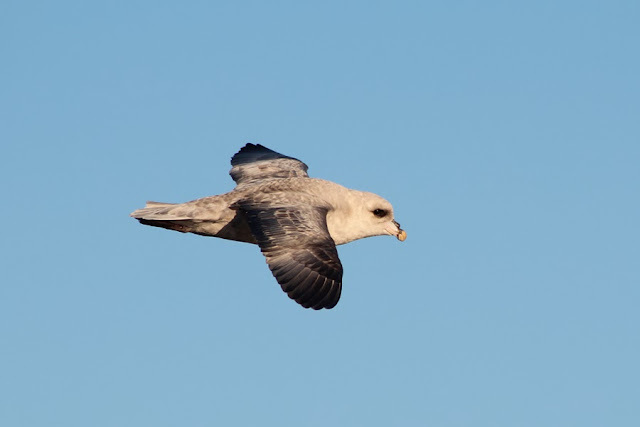 Any time a little bird was spotted circling the boat, I would keep my fingers crossed that it would land on the back deck and stay a while. I even told most of the vessel's staff to let me know if they saw "little birds" anywhere on the boat. 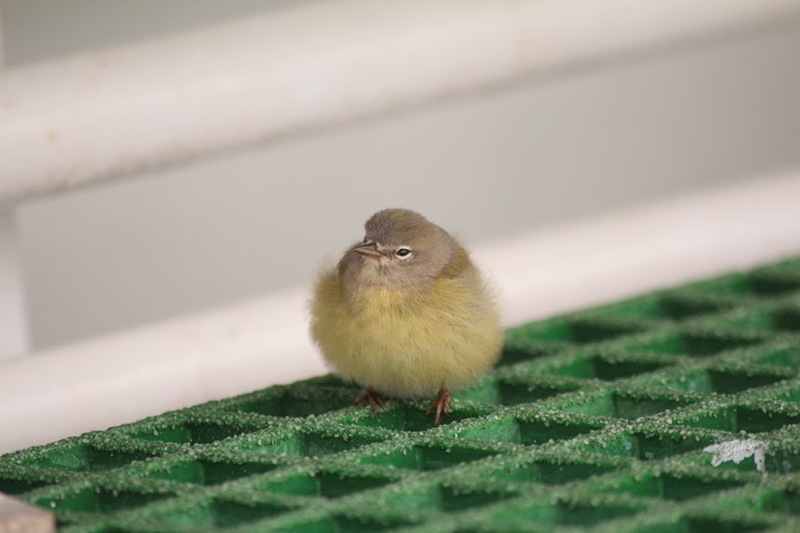 Often, the passerines that find the boat are very lost and perhaps doing locked in a tragic mirror migration. Off Labrador, the most interesting visitors were a female Prairie Warbler and two Clay-coloured Sparrows. If you check their range maps, you'll see they were hopeless navigators! Here is a selection of some visitors from terra firma. In October, Newfoundland had a little invasion of Northern Wheatears. I had already seen one on the vessel off Labrador where you could say it is not overly unexpected, but I only had my binoculars when I spotted it. Luckily, a second one found its way to boat while I was off Newfoundland during the invasion. It spent the day on the boat and was very cooperative. I only spent around 15 minutes with it in total and then I left it to rest. Hopefully it had the energy to get to land! 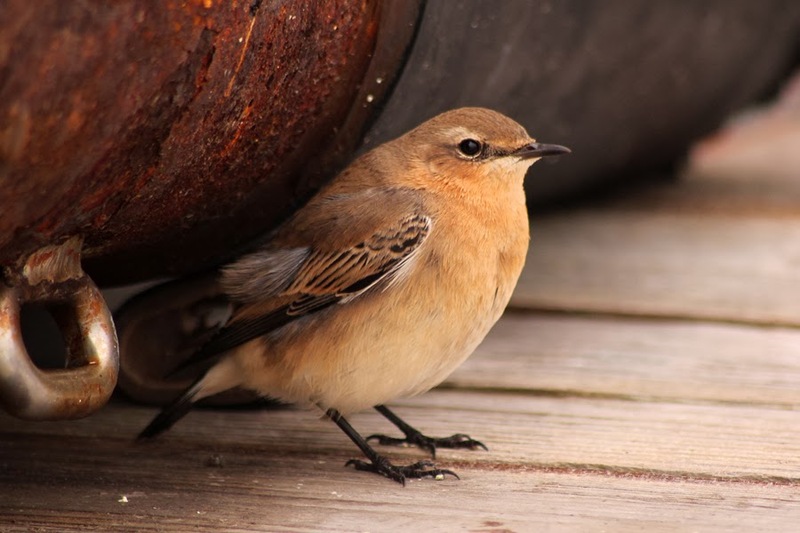 One of two Northern Wheatears seen on the boat - awesome! That's all I'll post for now. 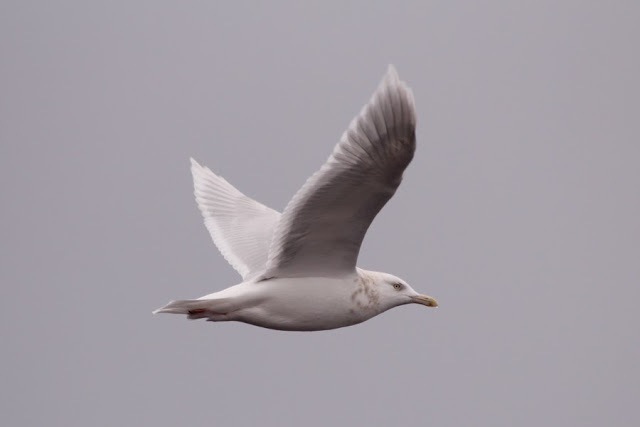 Hopefully I obtain some better photos in the next short while or perhaps have a passerine or two drop in. If not, you'll be getting the bottom-of-the-barrel record shots in my next installment.